Small is the new big thanks to clever thinking and design. Micro houses seem to be getting a lot of publicity lately, including entire shows on TV, but what about micro boats? When a small boat can do almost everything that a big one can, and it costs less to buy, maintain and moor, it’s time to rethink size and debate whether micro could be the next big thing. 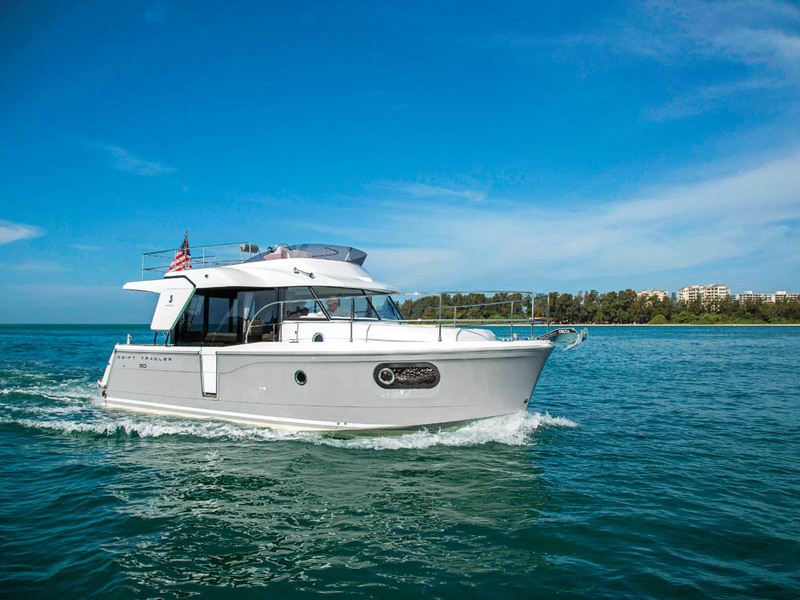 The 30-foot baby of Beneteau’s Swift Trawler family has come to our shores, and this trawler packs a punch. I took a ride with Barrett Canfield of South Coast Yachts in San Diego on the first hull on the West Coast. Currently, this model is brought over from France, but Beneteau plans to build them in its Marion, S.C., facility soon, which may make lead times shorter. 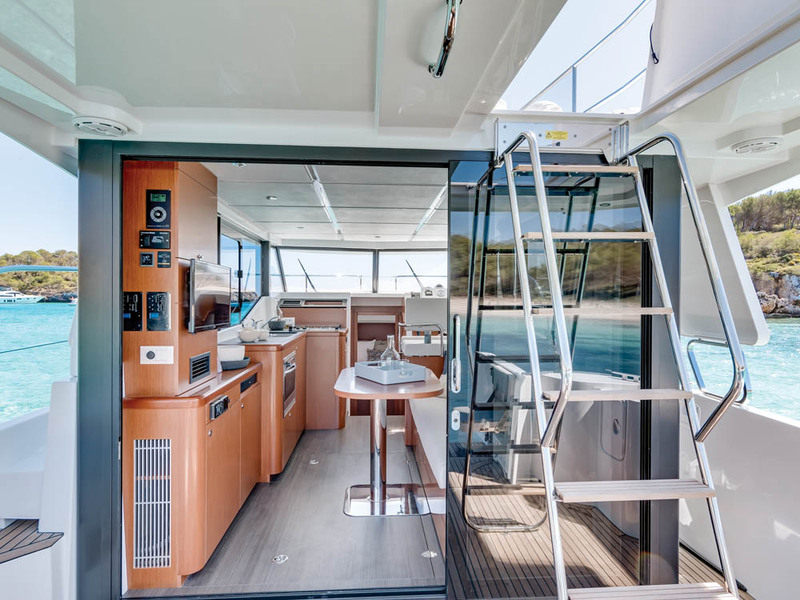 The smaller the platform, the more creative the builder must get, and both the interior and exterior of the Swift Trawler 30 show some ingenious thinking. For example, the aft cockpit is packed with thoughtful and functional details. First, it can be expanded by opening up the transom doors both port and starboard, creating a nice walkthrough from the salon to the fixed swim platform aft. Two folding seats are integrated into the swing-out transom sections. With the seats open and the salon table brought outdoors, the cockpit is a nice alfresco dining area. The cockpit has other hidden features, such as a built-in hot/cold freshwater shower and the handle for a Whale Gusher manual bilge pump. My favorite is the telescoping Besenzoni dinghy davits that are integrated into the transom corners. They stay tucked away until deployed. To starboard is the ladder up to the flybridge. To use it, angle it farther aft so it’s easier to ascend or descend. When done, just slide it up against the three-panel glass sliding door and lock it out of the way. 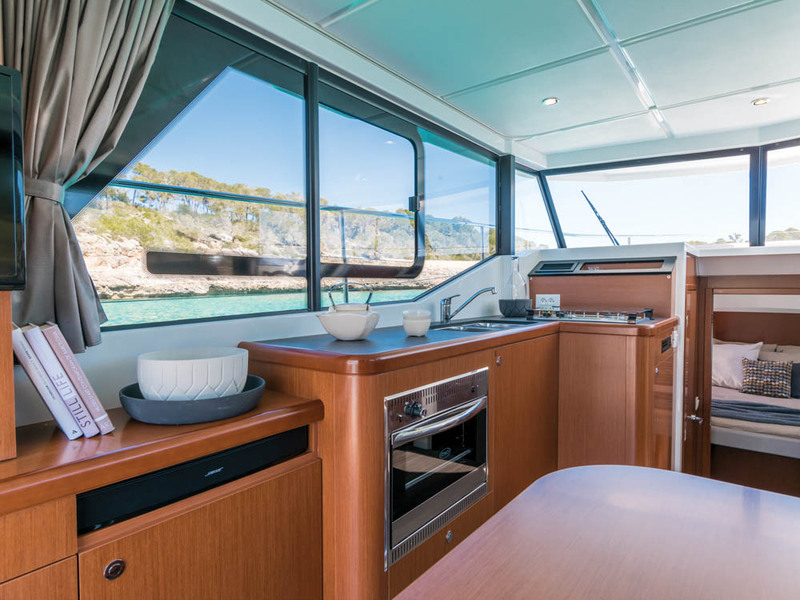 The Swift Trawler 30 is asymmetrical with the cabin house offset to port, which makes the starboard deck the wider path to the bow. Up this side is a hinged door in the hull for easy side boarding. It’s also near the door that leads inside to the helm, so the driver can step out onto the deck and then right onto the dock with a line in hand. Two steps lead from the sidedecks up to the bow where there is a double sunpad (with cupholders, of course) and the optional Quick electric windlass. Given the sunpad forward and the clever cockpit aft, there’s a lot of outside space, but that’s only part of the story. 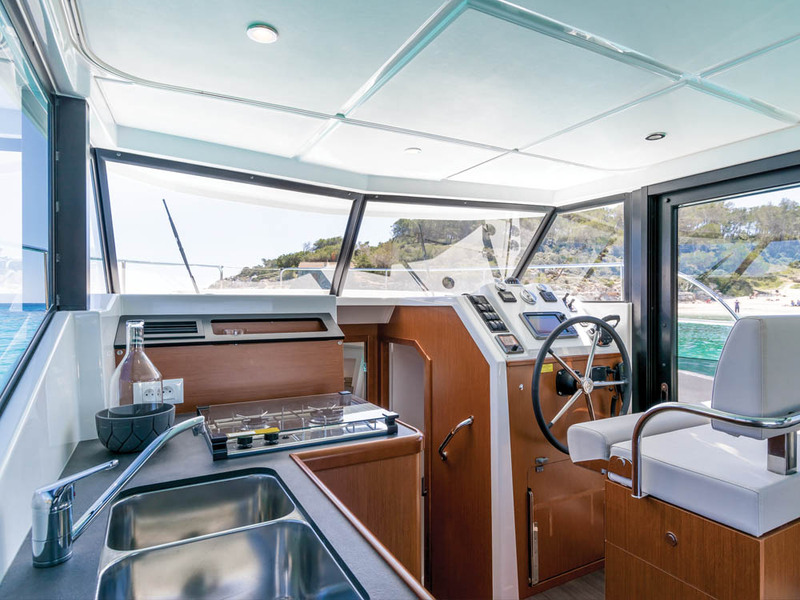 This micro trawler has a flybridge with a single helm seat to starboard and an L-shaped settee to port. Four can sit comfortably here, but five will be a squeeze on this settee that doubles as companion seating underway. 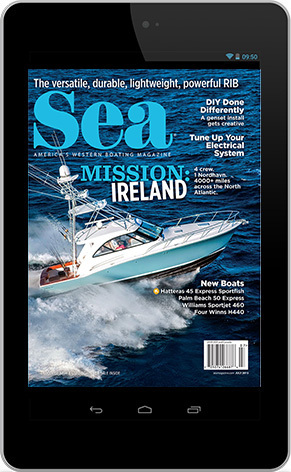 On the flybridge, our test boat was equipped with a 16-inch Raymarine eSeries HybridTouch multifunction display (MFD) and bow and stern thruster controls on the dash, as well as a seven-foot radar mast that makes a good handhold when moving about in a seaway. The flybridge makes the boat feel much bigger than 30 feet. Canfield likes to call this the “leisure helm,” as he doesn’t expect anyone to drive long distances from up here. This station will most likely be used when pulling up to a mooring with crew on the bow or while harbor cruising, but the bulk of the driving and docking will be done using the lower helm. Speaking of the main helm, it’s really quite well organized. Situated forward of the salon to starboard, it’s accessible directly via that great side door. Unlike the wheel up top, the vertical leather-clad destroyer wheel at the lower helm feels good and looks shippy. 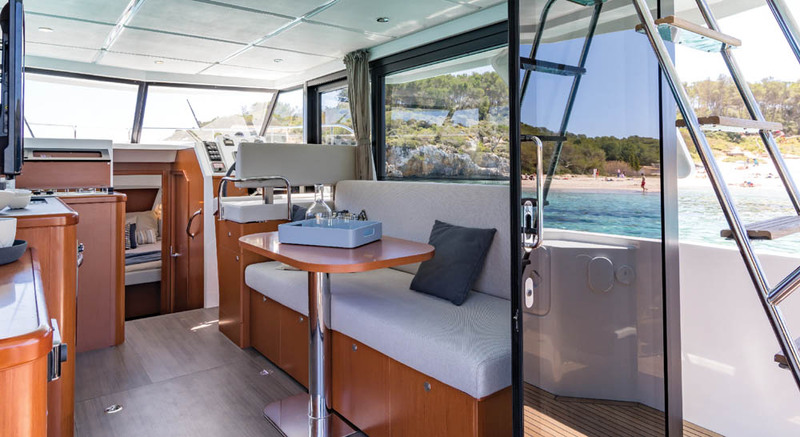 The dash is well laid out with a nine-inch Raymarine eSeries MFD (I’d opt for a 16-inch one like on the flybridge), thruster controls, engine throttle, rudder angle indicator, and various system switches. Get familiar with the Lenco electric trim tabs, because the horizon disappears briefly when the bow rises as the boat comes out of the hole. Across from the helm and down the port side is the galley. Near the forward bulkhead is the two-burner stove. Our test boat had a ceramic Kenyon stove but the standard is propane, which I prefer because I hate to have to fire up the generator just to make coffee in the morning. Twin sinks, a microwave/convection oven and a Vitrifrigo under-counter refrigerator are standard. I’d opt for the second half-refrigerator, to increase cold storage capacity. The salon has one long straight sofa along the starboard side. The seat is very deep and when I pressed my back up against the backrest, my feet dangled. Due to its depth, this sofa makes a very comfortable bed for one in its normal configuration. However, the seat also slides out and the backrest lowers to create a 50-inch-by-76-inch bed that sleeps two adult-sized guests. Three soft-close drawers below the sofa provide good stowage. A curtain on a track that runs the perimeter of the interior provides privacy, so the salon converts to a guest cabin in less than a minute. Four people will fit around the portable dining table, but with elbows flying, only two really have room to eat comfortably. The table secures to the cabin sole with a bolt that is removable, making the table portable. Two wooden, cushion-topped boxes are included. They do double duty as stowage compartments and as seats for guests. The headroom in the salon is 6 feet, 5 inches, and the finish on our boat was an Alpi wood mahogany. A Bose stereo system provides tunes inside and out, and a flat-screen TV is positioned across from the sofa where it is visible from the whole salon as well as from the helm seat. Light pours in through the vertical side windows. Our test boat had a one-cabin, one-head layout with the master three steps down from the main deck and through a double door that is split down the middle. 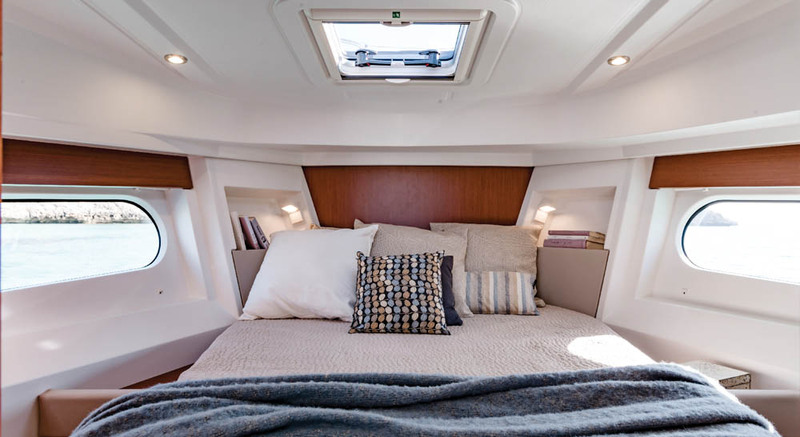 Here, the center island bed (60 by 78 inches) has small steps on either side and is actually an elegant improvement over the V-berth bunk on the Swift Trawler 34. It’s a very bright stateroom thanks to an opening hatch overhead and a round opening portlight on either side embedded into two huge rectangular ports that are at eye level of folks in bed. A quick check of the anchorage is possible without ever getting up. Two lockers provide a bit of stowage as does a large compartment below the mattress. That said, a couple will have to be frugal with their clothing, because unlike the salon, places to stuff personal items are a bit scarce in the stateroom. The headroom is 6 feet, 6 inches, which is really impressive on a compact cruiser. The head is split, with the electric toilet and sizable rectangular sink to starboard and a very large separate shower compartment with a seat to port. The shower can be used as a wet locker or even to store larger items such as folding bikes. It’s a big space, and if it were eight inches narrower it would still be sizeable but would create room to put another locker in the master stateroom. Our test day was a sunny, warm Southern California afternoon with 10 to 12 knots of breeze on the flat water of San Diego Bay — basically ideal conditions for this kind of boat. The only waves we encountered were the ones we generated with our own wake, and at one point, we did place the boat broadside to these while switching from the lower helm to the upper. We had to hang on up on the flybridge, but down below the movement was manageable. Running with the wind with two people aboard, we reached a maximum speed of 21.6 knots at 3500 rpm, at which point the boat was getting 1 nautical mile per gallon. The boat settles into the 1 mpg slot around 2600 rpm and stays there all the way up to wide-open throttle. Counter to the definition of a trawler, the Swift Trawler 30’s semi-displacement hull will start to plane around 12 knots, which it can reach in nine seconds. A comfortable cruise is at 14 to 15 knots, which beats the pants off most trawlers. At seven knots you can go over six hundred miles and still have a small fuel reserve. 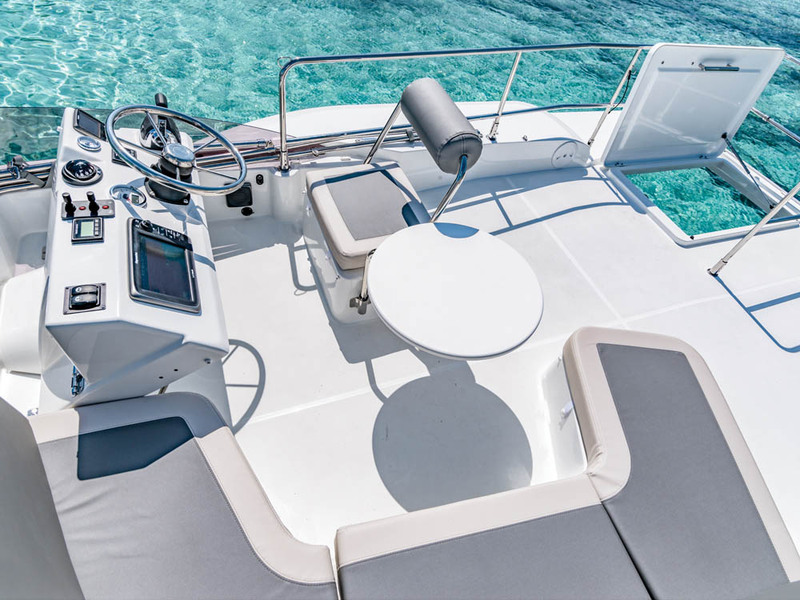 The engine room is accessed via a hatch in the salon sole and has plenty of room to work all around the single 370 hp Volvo Penta D6 diesel that has a straight shaft drive. An optional (and in my opinion necessary) 7.5 kw genset costs $21,000, but it will save a lot of wear and tear on the main engine. The lower helm is perfectly comfortable for longer runs and has easier deck access for docking. Using the bow thruster, Canfield expertly docked stern-to by standing outside on the starboard deck where he had good visibility forward and aft and could still reach the helm and bow thruster with his right hand. Then, it was just a step through the side door to put on the dock lines. The base price of the Swift Trawler 30 is $274,200, and our very loaded test boat is offered by South Coast Yachts for $395,000. According to Canfield, most well-equipped versions will cost between $350,000 and $375,000. Compare that with other small trawlers and you’ll be pleasantly surprised. LOA 32 ft., 9 in. Beam 11 ft., 7 in. Draft 3 ft., 5 in. Volvo Penta D6 370 hp diesel, hydraulic steering, bow thruster, flybridge, refrigerator/freezer, microwave, propane stove, water heater and more. 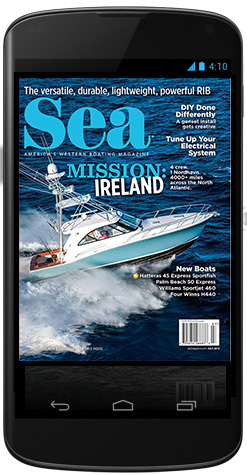 Navigation and communications electronics from Raymarine, blue or gray hull color,7.5 kw genset, stern thruster, electric windlass, extended swim platform, telescoping davits, air conditioning, extra refrigerator, Corian countertops, leather upholstery and more. 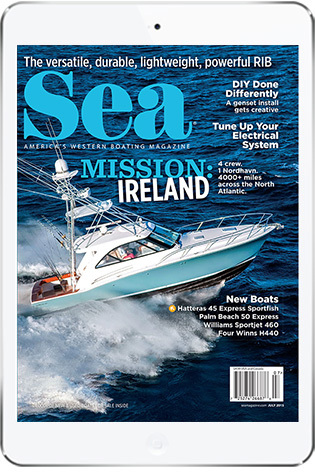 This entry was posted in Boat Tests, New Boats and tagged motoryacht, Trawler, Beneteau by bsheehy. Bookmark the permalink.